Sancheoneo Ice Festival is a unique winter festivity that attracts over 1,000,000 visitors every year! 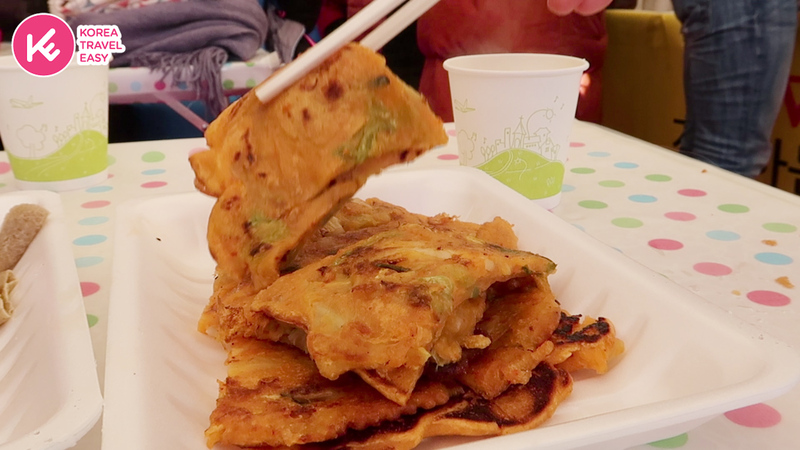 Together with the Singaporean blogger PancakePixie, we had a fun day at this festival! When we first arrived there we got KoreaTravelEasy Special free gifts: A fishing rod, lure, scarf, earmuffs and a hot pack. Which was really appreciated cause it was COLD! It took less than 3 hours to get there by shuttle bus and we all got ourselves a nice nap during the ride so we were all well rested on arrival. It was our first time Ice fishing ever! At first, it was quite hard but the staff was so helpful that we finally got the technique right! And we even caught more than 1 fish!!! PancakePixie caught her first fish! Sancheoneo is a fish which can only exist in the best clearest waters. After catching it they grill it for you on the spot and it’s SO delicious! We also got a food voucher so after we ate the fish we bought even more food! 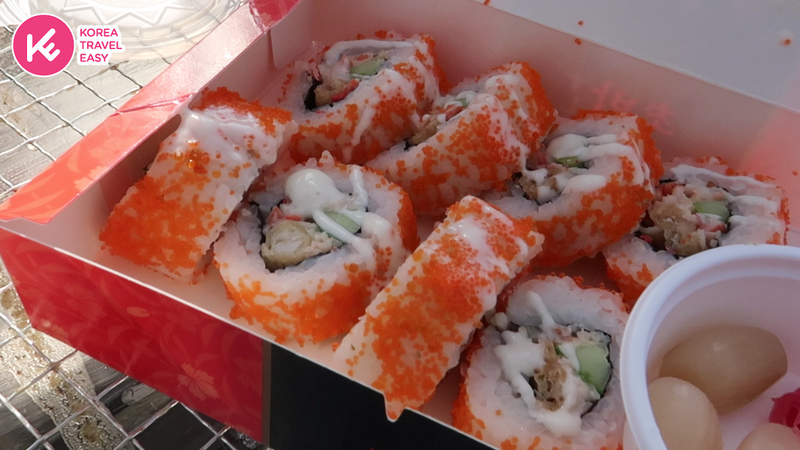 You could choose from Korean street foods such as fish cakes, spicy rice cakes, Korean pancakes, Korean donuts, Sushi rolls and more! The festival is BIG, there were quite a lot of other activities you could participate in such as ice sledding, snow sledding, figure skating, ice slide, bare hand fishing, zip lining and more! I would strongly recommend going to this festival once for a fun and unique experience, perfect for families with kids too! 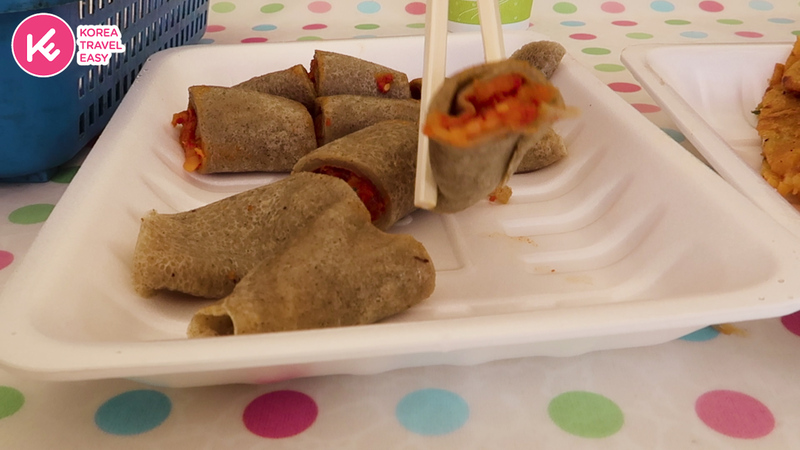 Watch our short vlog to see how much fun we had and what else the festival has to offer! Coming from a country with only either thundery showers or scorching heat from a yellow yolk in the sky, snowboarding was definitely one of my to-do list in Seoul. 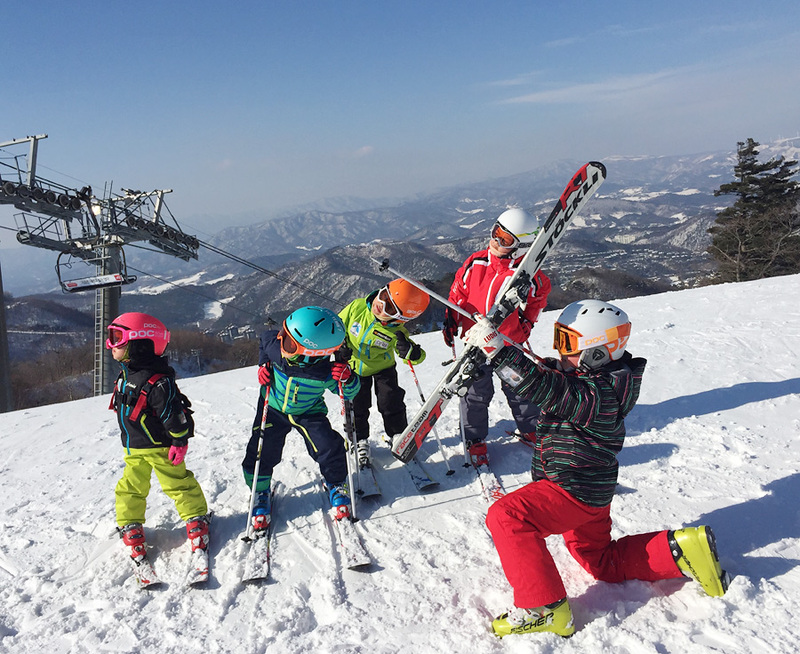 Having never experienced the feeling of coursing down snow at an angle on a snowboard, I signed up for KoreaTravelEasy’s Daemyung Vivaldi Ski Park and snowboard/ski lesson. Located in the Gangwon province of South Korea, it is actually only one hour away from Seoul. However, navigation was never my forte and looking for transportation to get around would be very troublesome. Thus, KoreaTravelEasy‘s tour solved many of my issues because the pacakage comes with free shuttle bus service which brings you to and from the event! On the day of the tour, I waited in front of Lotte mall at 8.00a.m. because that was the pickup point I chose. You can also depart 7.30am from Hongik university, or 8.30am from Samseong station. At 10am, we arrived at Daemyung Vivaldi Park Ski Resort! The view was beautiful and I was so glad to see Singapore’s flag! I collected my ski world lift ticket and ski clothes rental ticket (included in the package) from the guide and went to exchange for my ski/snowboard gears! When I was done changing into my gears (you can choose from ski/snowboarding option and your gears would be rented to you based on your choice), I went indoors to look for my snowboard lesson instructor! I have never snowboarded before, so it was great that the package came with beginner snowboard lessons. There were only 4 people in the snowboarding group so the coach really spent time explaining how to snowboard to you in detail! You will learn how to wear equipment, walk/turn/downhill,falling and standing up safely, and how to do your left and right turn. Complimentary of KoreaTravelEasy early bird special gift set, I had free ski gloves which kept my hands warm in the snow! The gloves are really important because you will fall alot when skiing and the coldness from the snow can really numb your hands. Other things included in KoreaTravelEasy special gift set included hot pack and T-money Metro card with special discounts at selected stores. Soon after, we headed outside for our lesson. Went on the lift too! The view was spectacular from above. Apart from snowboarding, you can also opt to ski. Although many people say that skiing is easier than snowboarding, I find that I have a hard time skiing than snowboarding. I guess it is up to personal preference so you can go twice to see which one you prefer? Hahaha. What I like about KoreaTravelEasy is it has many different options to choose from. Even if you go together with your family, the elders can opt for a free time package (USD$35) instead of snowboarding least they get injured. That way, the whole family can spend time in the same place despite taking part in different activities! 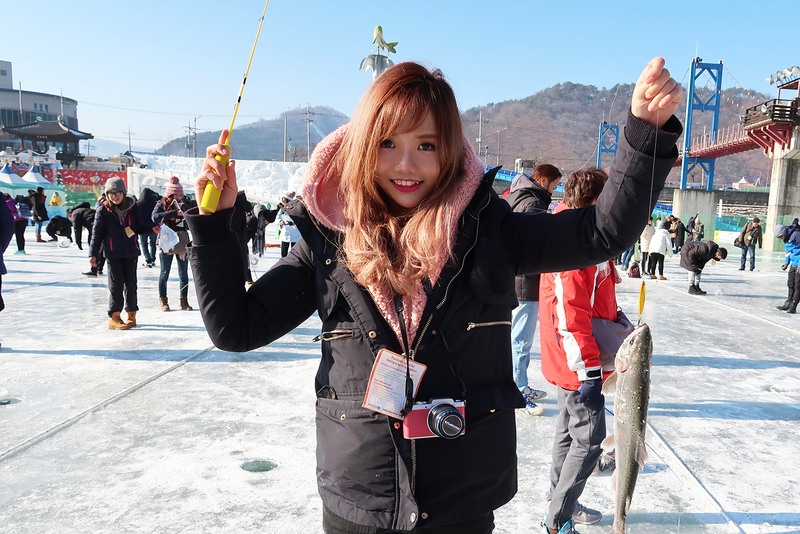 Also, because it is winter season, I will also be blogging about the 54% off Hwacheon-Sancheoneo Ice fishing festival and one day bus tour (1+1, pay for 1 person and bring another friend for free!) so stay tuned! You can also participate in other winter experiences like Night skiing! 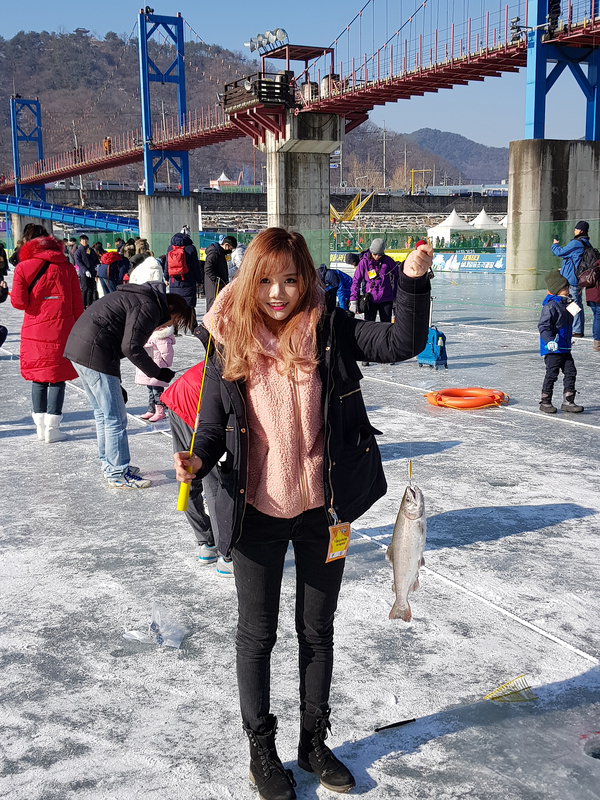 Winter in Korea is sort of a mixed bag; the weather is extremely harsh on certain days and at the same time, a season fully packed with fun activities, which are too hard to ignore. It is a love-hate affair. The most freezing and windy breeze peaks in January and it definitely comes with different activities that you can engage in. It is your chance to learn winter sports such as skiing and snowboarding if you are a beginner. For others, winter holidays and leisure weekend getaways is a not-to-miss on their winter to-do lists. There are so many Ski resorts and winter festivals around Korea that makes it possible to meet the needs of travelers who wants to experience the best out of the season. Most of these resorts are very close to Seoul (90-minutes) which allows for a 1-Day tour with convenient shuttle transport. Do you intend traveling to Korea during the winter season? Here are some of the things you can do. 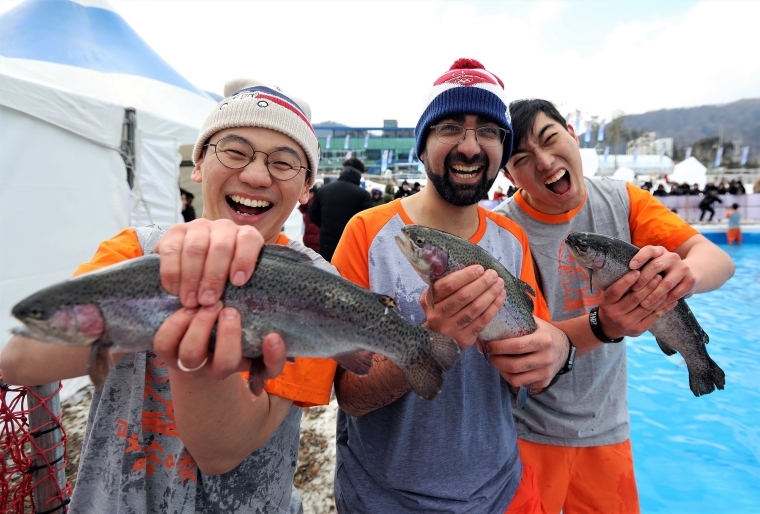 The Hwacheon Sancheoneo Ice Fishing festival has been held every year in the city of Hwacheon, Gangwon Province since 2003, attracting tens and thousands of visitors. CNN considers the festival as one of the Seven Wonders of the World and also a representative festival of Korea by the Korea Ministry of Culture, Sports and Tourism. 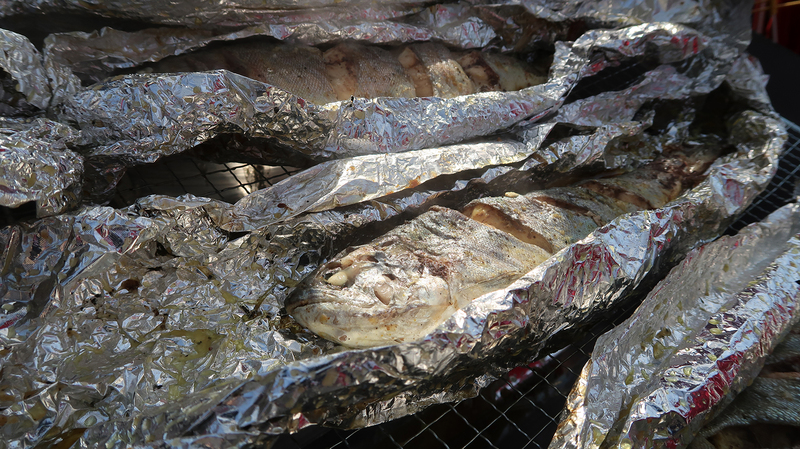 You can try bare-hand fishing, rod fishing and get to eat the fish you catch yourself. It runs for only a limited period of time in January, so you better experience it now by joining this affordable travel package below. 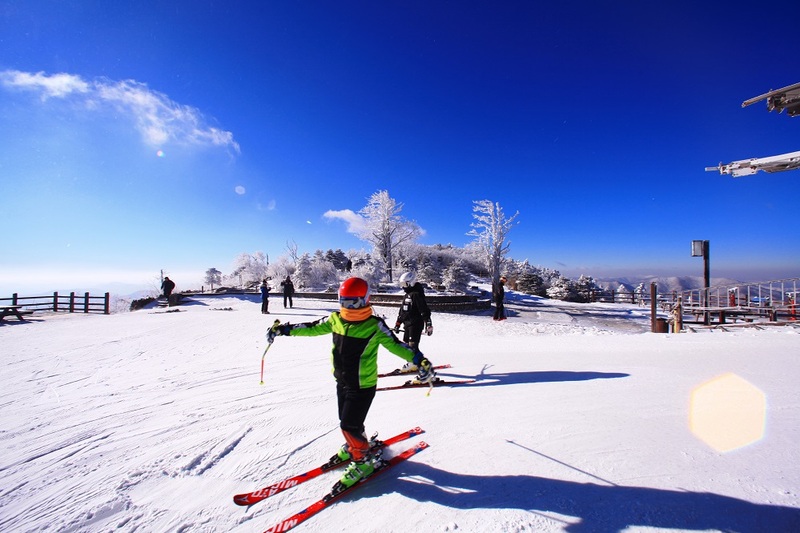 Elysian Ski Resort is located in the Gangwon province, very close to Seoul, and equipped with a multitude of ski slopes. With its location in a valley, skiers can enjoy a beautiful panoramic view of the natural snow scenery. Elysian is one of the best ski resorts in Korea for beginners, intermediate and experienced skiers. They also offer lessons in Ski and snowboard. You can visit Elysian for their fun-filled Night Skiing or join any of the 1-Day Tour Packages. Join the Elysian Ski Resort tour package with options to visit Nami Island, Hwacheon Sancheoneo Ice Fishing Festival, and Chuncheon Myeongdong K-Drama Skywalk. You might have already heard or seen the buzz all over the internet. 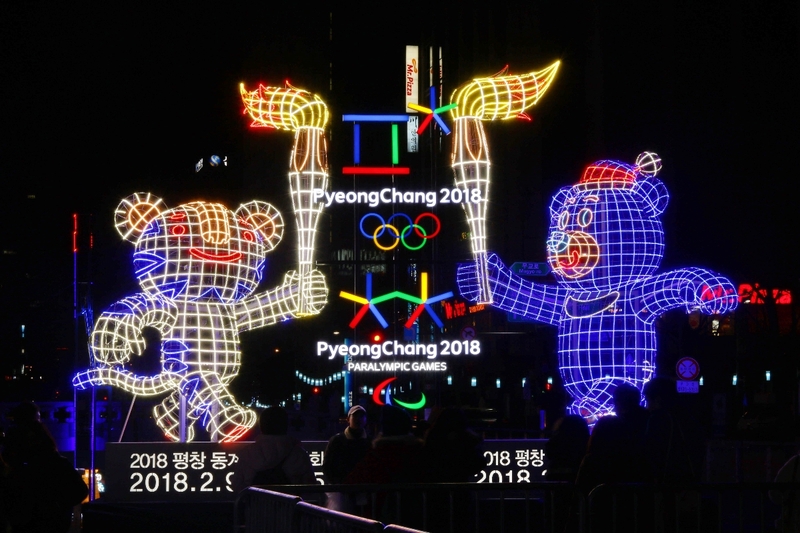 The City of PyeongChang will be hosting Korea’s first Winter Olympics from 9-25 February and the Paralympic Games from 9-18 March. This is a cool opportunity to see the games, cheer on your favorite teams and tour Korea’s top winter destination. There are foods to try, historical sites to visit and new stuff you can try. The excitement is building up and you don’t want to miss it. You can buy the Games Tickets from the PyeongChang 2018 Website. 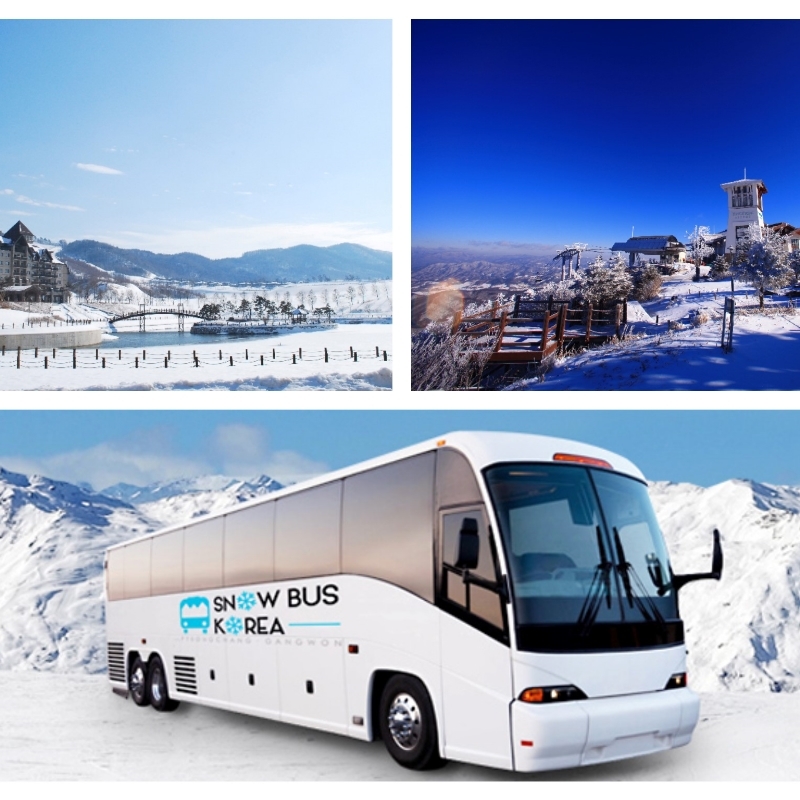 The Shuttle bus from Seoul to Alpensia Ski resort and Yongpyong resort is the most convenient way to travel during the winter ski season. Book today at US$18. Vivaldi Park is considered a top ski resort in Korea with great leisure and recreational facilities for every person. It is the most visited Ski resort recently. Also located in the Gangwon province, it is only a one-and-half hours’ drive from Seoul. Aside from having great slopes for skiing and snowboarding, it has other hospitalities that makes it a perfect winter holiday destination. There is the Ocean World water park with indoor swimming pools, a Hot spring Spa, an Equestrian club, and hotels to make your stay enjoyable. Find out how you can visit Vivaldi Park for a Winter Ski experience. 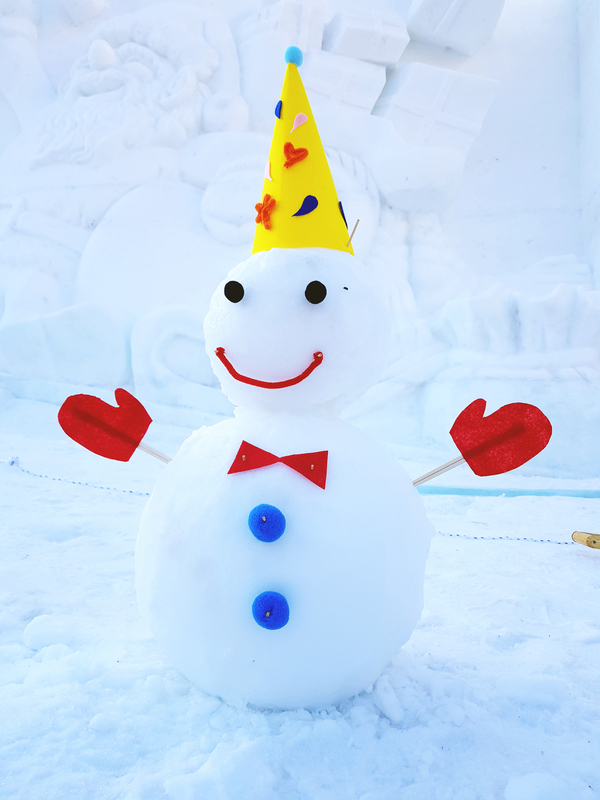 Travel to the Taebaek Mountain to view beautiful and sculptured snow objects. The festival opens from December till the end of February. It is a great sport for snow photos. You can visit either in the day or the moonlight display. 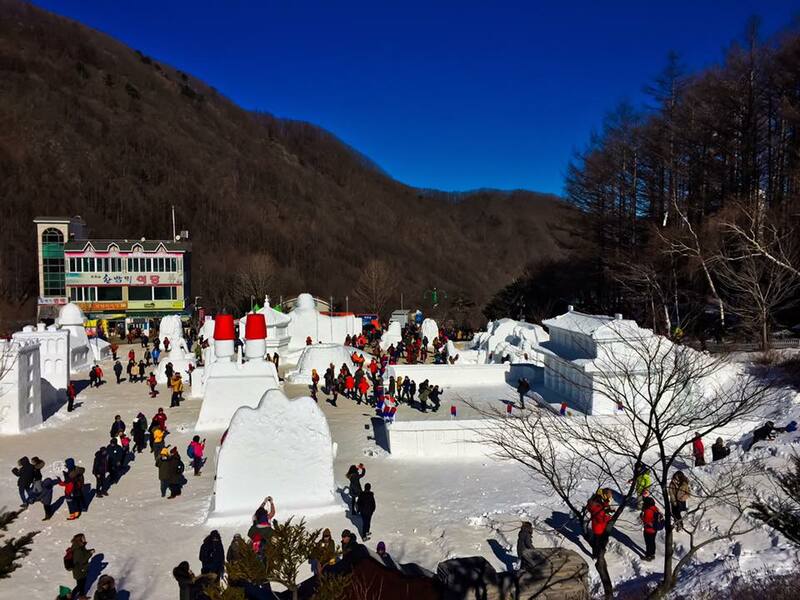 Visit the official site Taebaek Snow festival for more information. If you are looking for the Ski resort with the best snow condition and less crowd, Oak Valley is your preferred choice. It also has the best terrain for beginners to undergo ski lessons. It is located near Wonju in the Gangwon province. 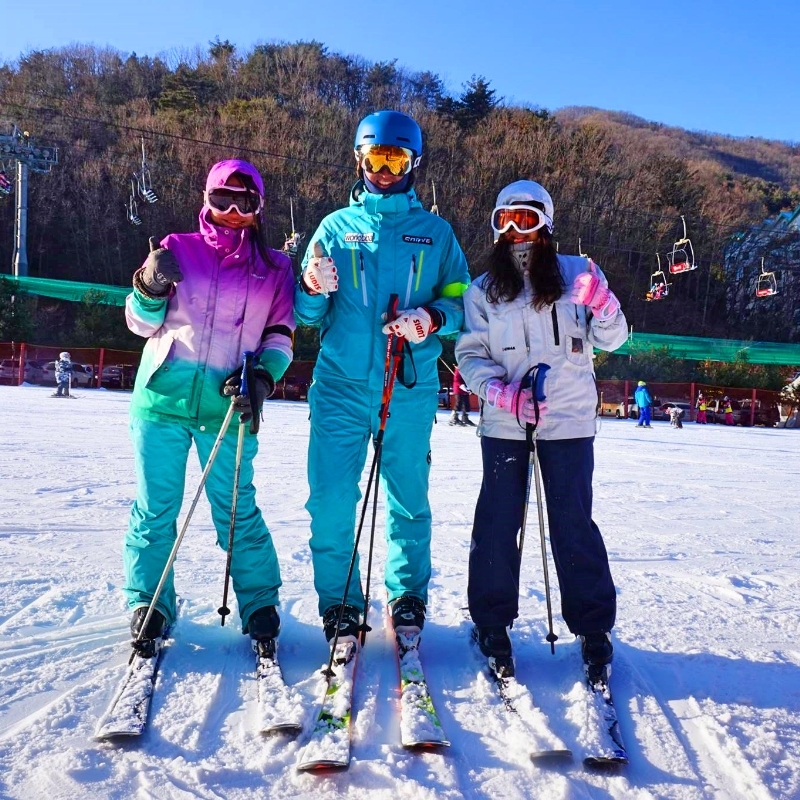 Oak Valley Ski Resort is one of the best places in Korea to Ski for beginners. Join the 1-day Ski tour which includes free shuttle and Ski lessons for $64. Nami Island is a half-moon shaped Island located near downtown Chuncheon in the Gangwon Province. Mostly accessible all-year-round for travelers. It became very popular when parts of the famous Korean Drama, “Winter Sonata” was filmed there. During winter, the island is covered in beautiful snow and ice, and the tree-lined roads give it a stunning picturesque feel for visitors. There is a zipline and ferry to get you to the Island. There are restaurants and convenient shops to purchase the little things you need. 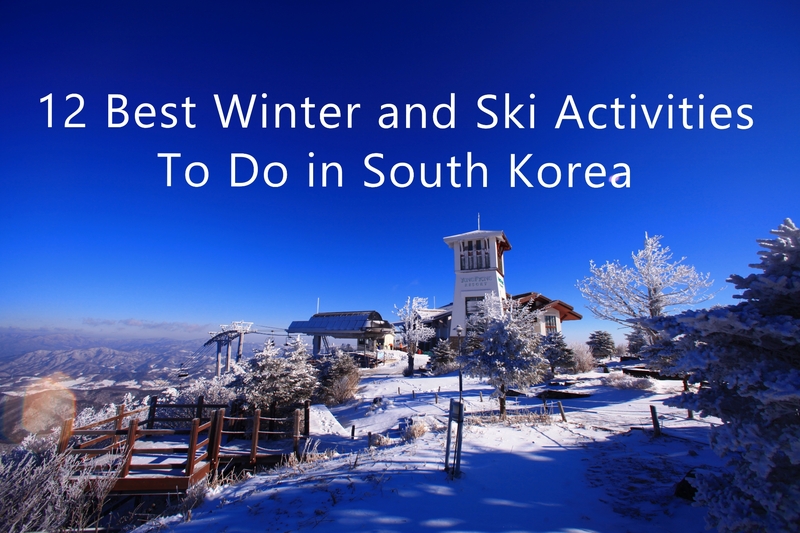 Korea is the best place for Ski Tour and holiday activities during the winter season. Experience amazing ski and snowboard activities at Vivaldi Park Ski World at a discounted price. Book your spot today. Did you know that there is a Strawberry season in Korea from December to June each year? Korea’s soil produces some of the biggest and sweet strawberries you can find. You can join the tour to some of the strawberry farms near Seoul and pick strawberries. The advantage is that you can take home 500g of the strawberries you pick. How nice! 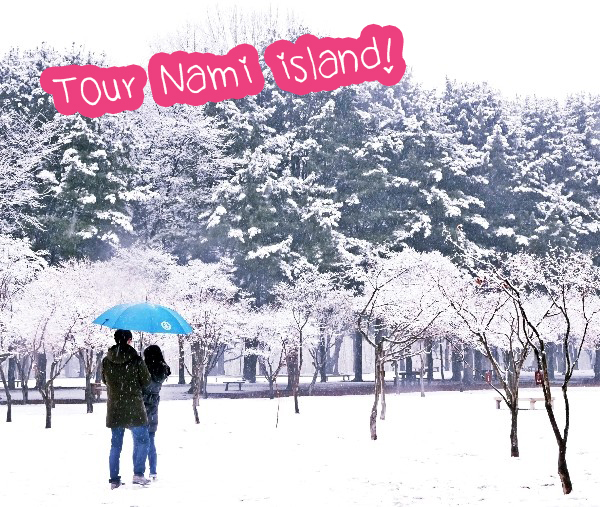 Within this same day tour, you can visit Petite France, Nami Island and also the Garden of Morning Calm Light Festival. Join this fun experience here. Explore Nami Island, Petite France Village, Korean Strawberries picking at a local strawberry farm, and The beautiful Garden of Morning Calm in just one-day tour. Book today at $90. Yongpyong Resort is one of the venues for the 2018 PyeongChang Winter Olympic and Paralympic Games. It is Korea’s first modern Ski resort having over 20 slopes and full-service amenities like restaurants, bowling alley, sauna, hotels, and karaoke. 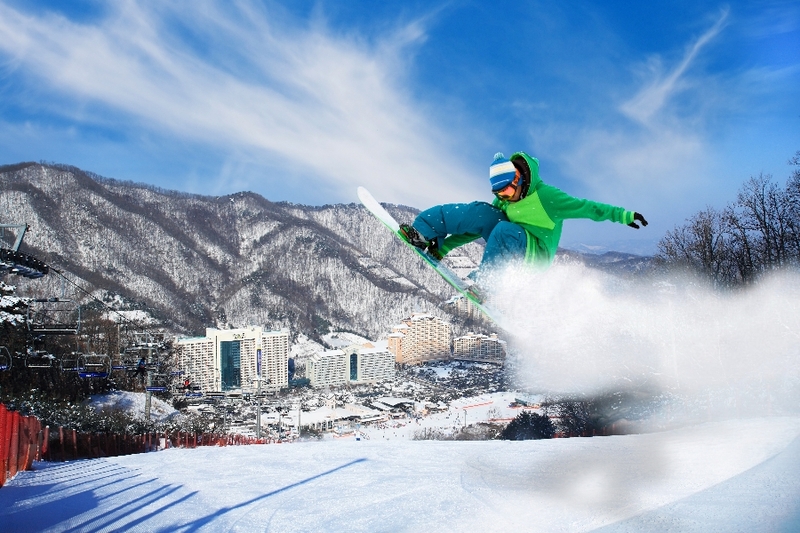 Ski and snowboarding activities abound at Yongpyong resort. It is also famous for being featured in Korea’s top dramas; Goblin and Winter Sonata. If you intend to visit the resort, do it as early as possible since it will be closing for the Olympic Games preparations. Visit the Korean countryside in winter AND ski in Korea! 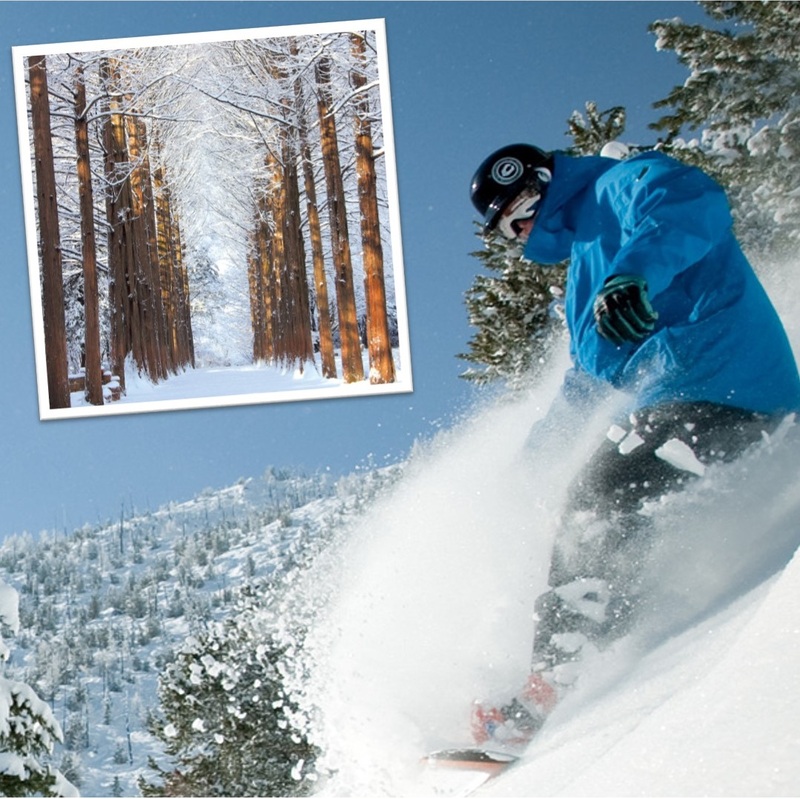 Our 2 Days, 1 Night Yongpyong Ski Resort Package includes transportation, accommodation, ski rentals, and lift ticket. Try skiing and enjoy relaxing at a Korean ski resort. 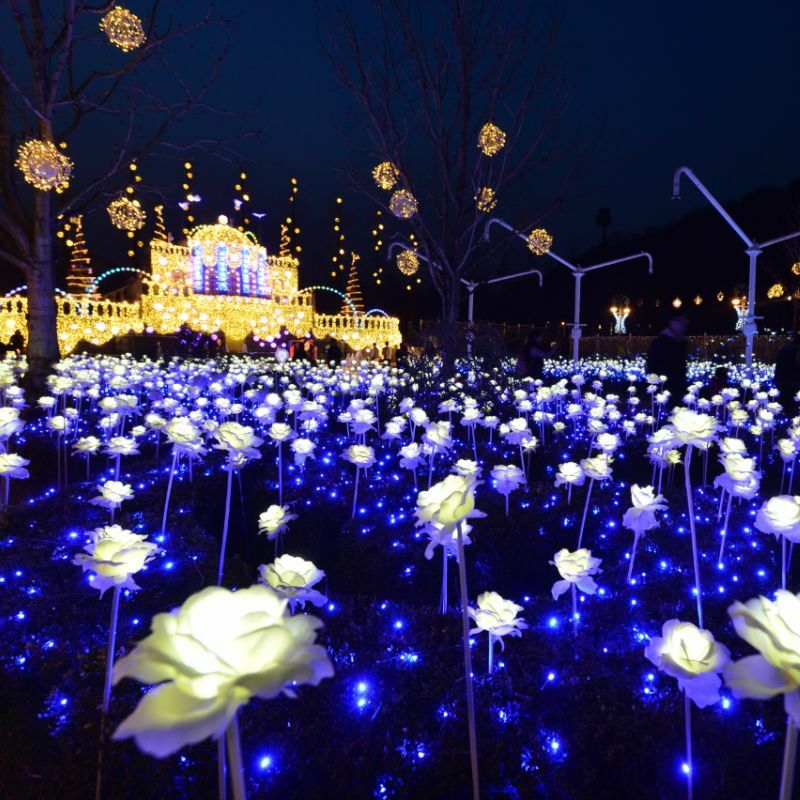 Everland is Korea’s largest Theme Park with enormous activities to explore. A top spot to have endless thrilling fun with friends and family at very affordable cost. You can explore the T-Express rollercoaster ride, Zootopia, Amusement games, VR Game centers, Cable car rides, Panda world, Lost Valley Safari tour and many more. During winter, you can enjoy the snow buster ice sledding and fireworks amidst the beautiful lights display in the gardens during the night. Check out the Everland 1-Day Pass here. 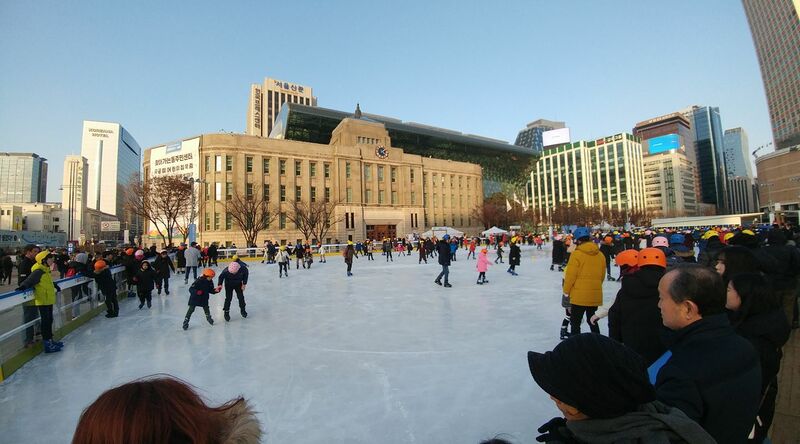 Seoul City Metropolitan Government has been operating the make-shift ice rink at the Seoul Plaza in recent years. It is fun and inexpensive. With only 1,000 KRW per hour, you can rent skating shoes and have the winter time of your life. It is opened from 10am – 9:30pm from Sundays to Thursday and 10am till 11pm on Fridays, Saturdays and Holidays. 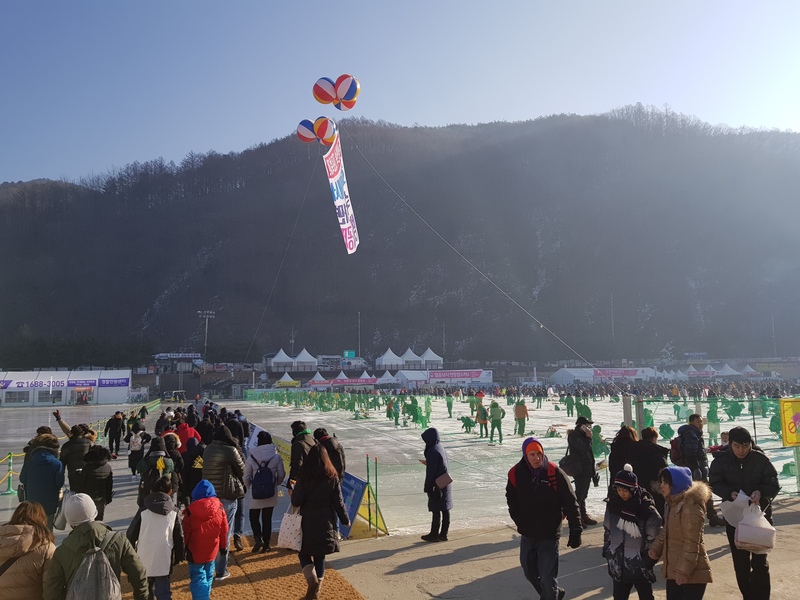 Other locations where you can enjoy the ice skating are the Lotte World, Olympic Park, Yeoiudo and Mokdong indoor Ice skating.